Sometimes, people will rip DVD to ATV for convenient streaming. But this process may let you lose surround sound on original DVDs for some unknown reason, like your DVD Ripper can’t give you 5.1 sound keeping or other reasons. To play DVD on Apple TV 4 with surround sound, you have to make sure that your DVD disc has an AC3 5.1-channel track. Some discs, especially those containing only audio, have PCM tracks. And you also need to make sure your DVD ripping tool can keep 5.1 surround sound. For example, old version Handbrake will only rip files into 2 channel AAC audio – obviously not surround sound. When you make sure your DVDs have surround sound, we recommend you to use Pavtube ByteCopy Mac to help you convert DVD to ATV with AC3 surround sound. It not only can rip DVD but Blu-ray to Apple TV 4/3/2/1. When your origianl discs have 5.1/7.1 sound, this software can keep it. As a versatile DVD Ripper, the program can stream not only DVD to Apple TV, but also rip DVD to iPad (iPad Air 3, ipad mini 4), iPhone (iPhone 6S,iPhone SE, etc. ), and many other popular video/audio format like WMV, AVI, FLV, 3GP, MKV, AIFF, AAC, and more. Play DVD on Android mobile phones is also a simple case with this DVD converting tool. How to Rip DVD to Apple TV 4 with AC3 Surround Sound? Step 1: Run Pavtube DVD to ATV covnerter, and import DVD movies files to the program. You can directly load DVD source from your DVD disc by inserting it to your DVD Rom, or you can import source movies from ISO/IFO file or a DVD folder stored on your HDD. Pavtube DVD to ATV 4 Converter checks the main title of the DVD automatically once you loaded the source movie. If you don’t want to rip the main title, you can uncheck it, and tick off whatever title you want to convert for Apple TV 4. 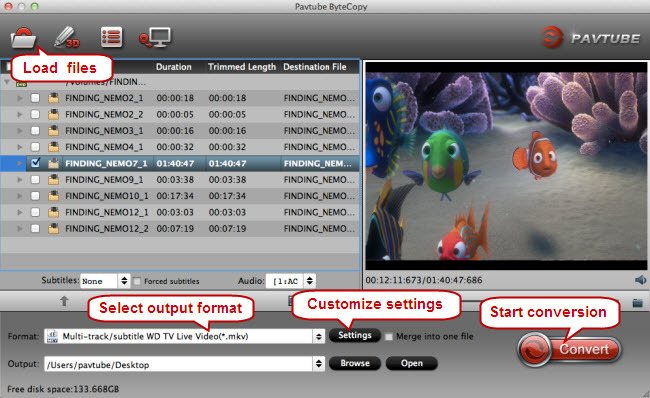 Plus, you can select your wanted subtitles track to be embedded into the resulted files before conversion. Pavtube Blu-ray to Apple TV Converter offers numerous presets optimized for Apple TV, ranging from the first Apple TV, Apple TV 2 to the new Apple TV 3rd Generation. No matter which ATV format you choose as output, an AC-3 encoded audio track will be included in the converted files for Apple TV to pass-through Dolby Digital 5.1 sound. In that case, it will work in surround sound when Apple TV is connected to audio receiver and in stereo when Apple TV is connected with TV only. For example, here we choose “Apple TV 3 Dolby Digital Pass-through (*.m4v)” as output format and convert DVD to 1080p M4V for ATV 4. By choosing this format, you will get two sound tracks in the resulted 1080p m4v video, one is stereo, and the other is AC3 encoded Dolby Digital 5.1 pass-through. When your Apple TV 4 is connected to audio receiver, the 5.1 surround sound will work. When ATV 4 is connected to your HDTV only, the stereo track will work. Click on “Convert”button to start Blu-ray to Apple TV conversion on Mac. The Mac Blu-ray Ripper for Apple TV will bypass copy-protections and convert Blu-ray to Apple TV video with AC3 6 channels track. After conversion you can click “Open” button to get the final ripped Blu-ray files with AC3 5.1 audio pass-through. How to Play MP4 on Appl TV 4 Successfully? 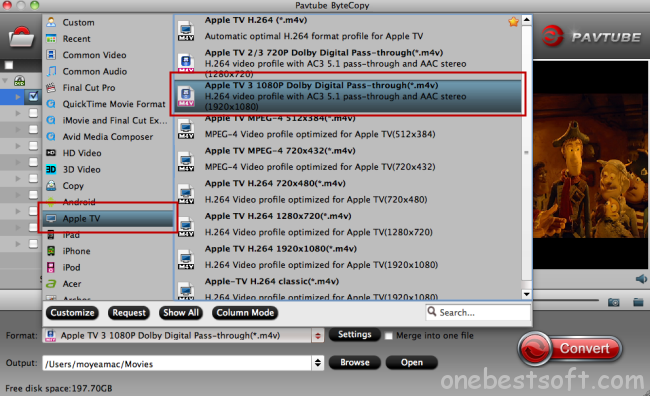 ← Previous Previous post: How to Rip Bluray Movies into iTunes for Apple TV 4? How to Rip Bluray Movies into iTunes for Apple TV 4?